Angie Maguire's entry in the “30 Days in the Gulf Stream" coloring contest. 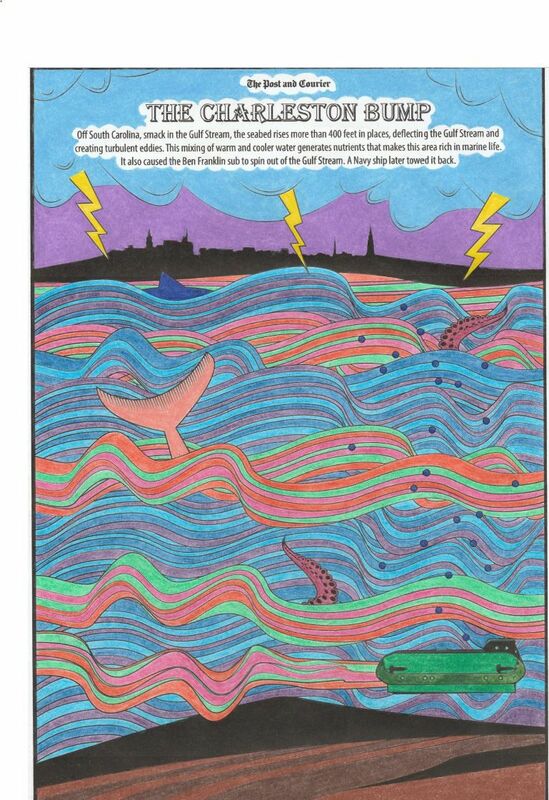 Jaden Joseph's entry in the “30 Days in the Gulf Stream” coloring contest. Ron Nihoff's entry in the “30 Days in the Gulf Stream” coloring book contest. A bevy of talented home and school artists made it difficult for our expert panel of judges to pick winners in our recent coloring contest celebrating the Gulf Stream. But decide we must! Jaden Joseph, 10, took home the top honors in the student division, showing off a creative, whimsical streak that took the piece in a whole new direction. What's more, a big shout-out goes to all the students in Veresa Parker's 5th grade class at Hanahan Elementary School for their amazing entries that really tested our judges' ability to choose a winner. Honorable mention goes to Ron Nihoff, 77, who used a delightful spray of colors to bring his page to life. Thanks again to all who colored and entered. For those who would still like to test their coloring skills while learning about the Gulf Stream, visit www.postandcourier.com/gulfstream for a free copy of the book.